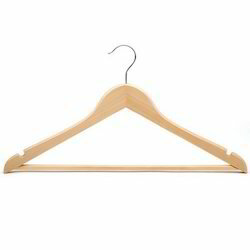 Manufacturer of a wide range of products which include wooden hangers. With thorough understanding of the relevant industry, we are offering a wide range of Wooden Hangers. The provided hangers are designed by our adroit professionals using superior quality raw material and ultra-modern technology in line with set industry norms. We offer these hangers in variegated specifications and dimensions as per the requirements of our valuable clients. The offered hangers are used for hanging clothes.